AFC - 10/16/04 McDonald's Sows Death! If you were aware, would you voluntary agreed to suicide? If you were aware, would you purposely sentence to slavery thousands of children from the Far East? If you were aware, would you still support torture and slaughter of animals and further destruction of our planet? ASK YOURSELF ISN'T THIS WHAT EVERYONE WHO EATS AT MCDONALD'S DOES! 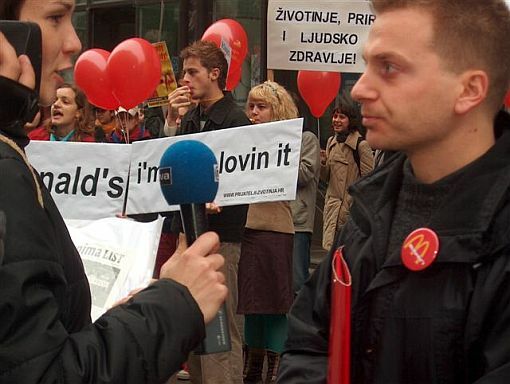 Animal Friends invites you to watch a praised movie "Super Size Me" and see how Morgan Spurlock for a month ate exclusively in McDonald's restaurants and therefore ended up in a hospital. The film with great viewing rates which stirred up debates all over the world will be premiered on October 15 at 4 P.M. in Student Center cinema, Savska 25. The film will start showing in all other cinemas on October 28. 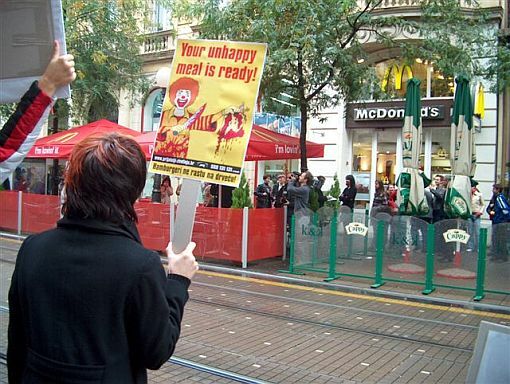 Animal Friends also invites people to join peaceful, yet noisy protest against the most powerful fast food chain - McDonald's. It will take place on Saturday, October 16, 2004, at 12 noon. 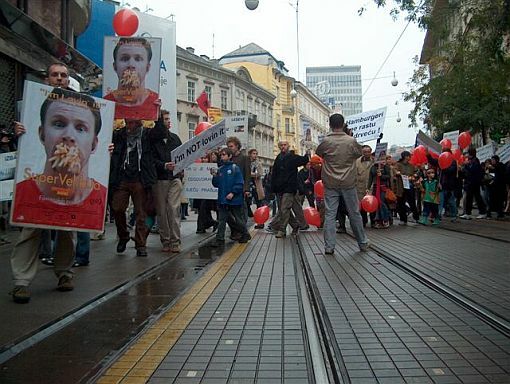 Noisy protest march of activists carrying banners and balloons, handing out leaflets, chanting slogans and making noise with megaphones and whistles, will start off at noon in front of Croatian National Theatre. 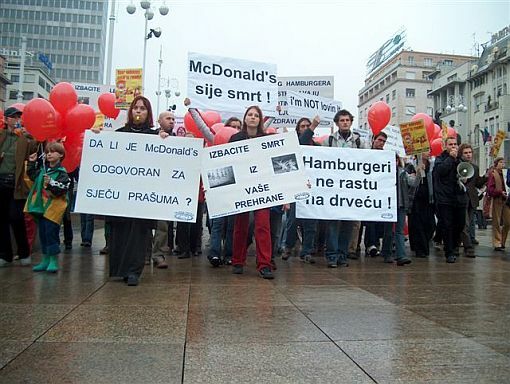 The march is routed along Frankopanska ulica, Ilica, Ban Josip Jelacic Square and stops in front of McDonald's restaurant in Jurisiceva ulica. 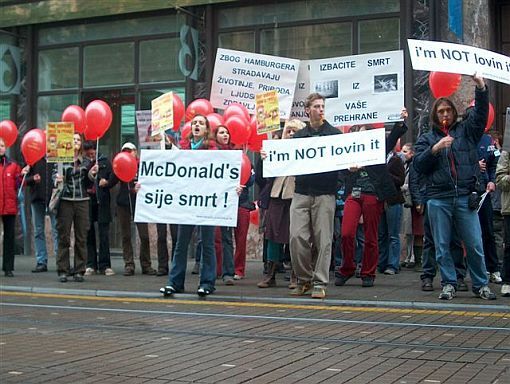 Let's boycott McDonald's, let's stop McDonald's from sowing death!